PTSuks Uncanny World: Streaming On Wii No Longer Requires Netflix Disc, There's An App For That! Streaming On Wii No Longer Requires Netflix Disc, There's An App For That! Looks like you no longer need to have the Wii netflix disc in the console to play netflix streaming movies. There is an app you download to your console via the Wii Shop Channel. Of course you still need a netflix $8.99 netflix account but its nice to not need the disc to watch from the Wii! I thought it was pretty stupid to have to have the disc in to watch anything, it was such as a pain too to have to switch out from Mario Galaxy just to watch a b-movie. Already have a Wii console? Go to your Wii menu, download and install the Netflix application from within the Wii Shop Channel, and follow the on screen instructions to connect your Wii to your Netflix account. It's that simple. To truly understand how the Wii console revolutionizes gaming, you have to try it for yourself. Quite simply, Wii is for everyone. The ease of use and interactivity of the Wii Remote™ and Nunchuk™ controllers allows for a unique social gaming experience for the whole family. You don't just play Wii, you experience it. Wii is not just a gaming console, it's a reason to get together with your friends and family and play today's hottest games. 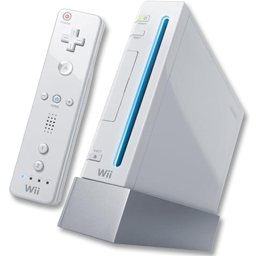 Wii offers legendary Nintendo franchises like Mario™, The Legend of Zelda™ and Metroid™, as well as all new classics like Wii Sports™ and Wii Fit™ Plus. Create your own Mii™ character to star in specially designed Wii games. For those with broadband Internet access, play friends online over Nintendo® Wi-Fi Connection or use the Internet Channel to surf the net from your sofa. You can even use Wii Points to downloadclassic Nintendo games using the Wii Shop Channel. Take a look around and see why your TV is not complete without Wii. What can you do with your Wii console once it's connected to the Internet? Instantly watch TV shows and movies streamed from Netflix in your living room, via your Wii console. Just sign-up here to receive your Netflix instant streaming disc for Wii and get started.